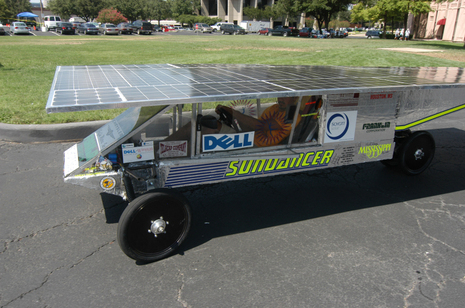 The Houston, Mississippi (population 4,079) Sundancer solar car team won the Dell-Winston School Solar Car Challenge open division championship trophy at Texas Motor Speedway for the sixth consecutive year. During the challenge’s four days and seven racing periods of three hours each, the Sundancer solar car traveled more than 619 miles (413 laps), at an averaged a speed of almost 30 mph, reached a top speed of approximately 60 mph and completed more laps than any of the 13 other cars competing in the race. Powered exclusively by solar energy, this year’s Sundancer weighed 356 kg, and is 5 meters long, 1.8 meters wide and 1 meter high. Energy from 856 SCHOTT Solar cells is stored in nine Power Sonic sealed lead acid batteries (only lead acid batteries are permitted to reduce cost and provide standardization), which feed electricity to an 8 hp SLC150 New Generation Motor. The car was built entirely by high school students. The body of the car is made from 3/4 inch foam board insulation. The Dell-Winston School Solar Car Challenge is the largest solar car competition in the United States. The Challenge is designed to encourage young people to study science, engineering, and technology. In the Challenge, teams of high school students from around the world design, build and race solar powered cars. On even numbered years the event takes place on a closed track at the world famous Texas Motor Speedway. On odd numbered years teams trek cross-country. This annual event has taught more than 3,000 participating students about technology, teamwork, problem-solving and commitment – skills they’ll need to compete in the 21st century economy – and has inspired thousands of others to get involved in long-term science projects. Wow, think what it might have done if it didn't have the aerodynamics of a brick! Kind of a random question, I was wondering if you knew how big of a solar cell would be required to provide 9 volts? If you could let me know, I would greatly appreciate it. Thanks. how much money do you payd for making that? If you want to read a great account of the Dell-Winston School Solar Car Challenge for the 2003 race, get the book Hulagu's Web - The Presidential Pursuit of Senator Katherine Laforge. It has the Presidential Candidate accompanying the sundancer team on their race from Austin to Florida. It mentions the problems the team had in the race and how each member was able to keep the team going even when they did have some major problems. They won the race that year also. The book is available on Amazon.com. The candidate considers the members of the team heroes for alternative energy movement. It is a very good read about the race and a good thriller over all. Fantastic car. Thanks for this post. Congrats for the winning school. wow excellent, is awesome to encourage the young boys and girls to create this, is an awesome idea. Solar Energy is now most every ware you look on earth and the 1,500 miles that this Solar Car Sundancer and its young team did in 2003 to win from Texas to Florida. Finish line was in front of the Florida Solar Energy Center and is now in the History Books. Sundancer and its team was meet by a host of Stars at the Finish Line like William Young Jr. Senior Research Engineer Solar Energy Research and The Patriotic Trumpet Player Monica D. Key Lindbergh and many more. Lets all help out our Young with Albert Einstein's Dream the Fuel of the Future Solar Energy. More should try to be like the Goodwill Ambassadors to solar energy as the Sundancer Team and Mr. William Young. Not to forget The Nobel Prize in Physics 1921 was awarded to Albert Einstein for his Photoelectric Effect. the ugliest car I've ever seen in my whole life!